Mark your calendars! The Rubberstamp Expo is coming to Chicago (St. Charles) on September 20th & 21st! If you plan on attending the show - be sure to stop by the Artistic Outpost booth. I'll be there along with some of the other Artistic Outpost Crew - come check out the beautiful samples using AO stamps and see what's new! 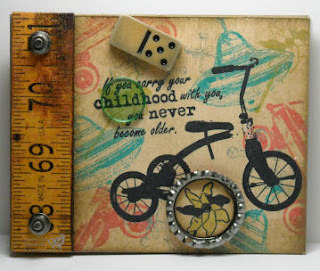 I'm also teaching a Distressed Ruler Class that weekend with Artistic Outpost Design Team Member Gerrie Johnnic - you'll be making a book like the one shown here! What a great little project! Thanks so much for visiting my blog this morning and leaving such a nice comment about my combo book :D. Love visiting your blog :)!